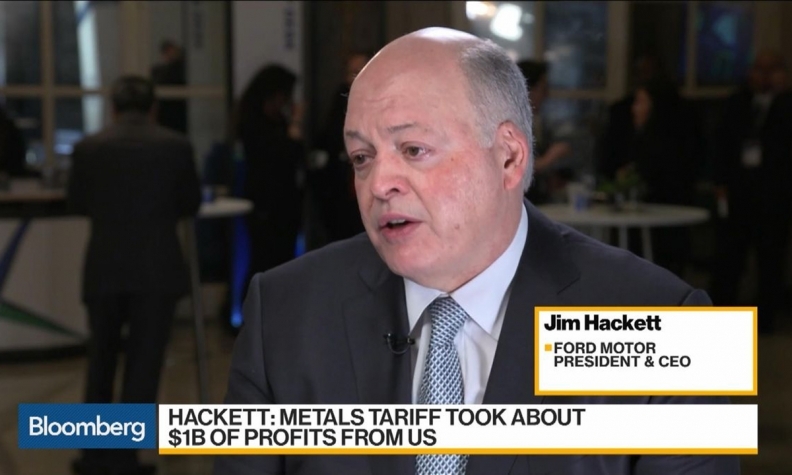 In an interview with Bloomberg Television, Ford CEO Jim Hackett said, "The metals tariffs took about US$1 billion in profit from us -- and the irony is we source most of that in the U.S. today anyways." DETROIT -- Ford Motor Co. CEO Jim Hackett encouraged the Trump administration to resolve trade disputes quickly or it could do "more damage" to his company, which is already suffering losses from tariffs imposed by President Donald Trump. "The metals tariffs took about US$1 billion in profit from us -- and the irony is we source most of that in the U.S. today anyways," Hackett said in an interview on Bloomberg Television. "If it goes on longer, there will be more damage." Ford and other global automakers have opposed the president's use of tariffs and the retaliation they spur. Last month, Jim Farley, Ford's president of global markets, described Trump's tariffs on steel and aluminum as a "significant headwind for us." A few weeks later, the second-largest U.S. automaker canceled plans to import the Focus Active crossover from China, citing Trump's vehicle tariffs. "What we're urging our administration to do -- where we're in China and in Europe -- we say, you need to come to agreement quickly," Hackett said. Ford reported net income in 2017 of US$7.6 billion, the most since 2013, but with analysts estimating a 29 per cent drop in profit this year, it's embarked on an US$11 billion restructuring effort to improve margins in the core automotive business while investing billions in electric and autonomous-vehicle technology. Ford shares were little changed at US$9.41 at 8:39 a.m. before regular trading. They have tumbled 25 per cent this year.